Everyone is looking for a reason as to why the broad stock market indexes plunged this week. The actual reason is pretty simple — automated trading. 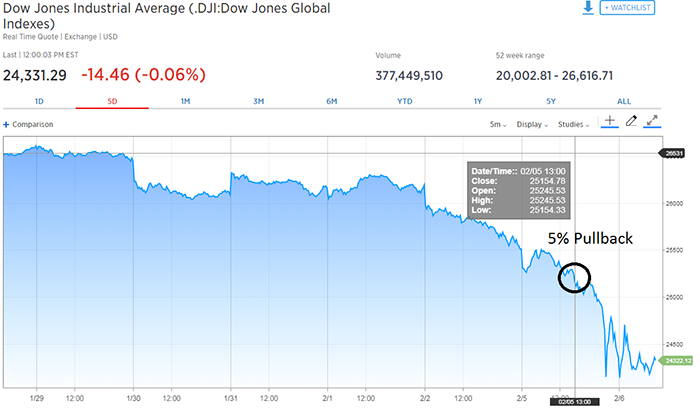 On Monday, after half a day of trading, the Dow Jones Industrial Average fell 1,000 points in less than an hour. And on Thursday, the Dow lost more than 400 points in 30 minutes, finishing the day down 1,000 points. What sparked the rapid selling was when the Dow hit a 5% pullback from its all-time high, set on January 26, of 26,616.71. I don’t think this was retail investors either, or a market order that market makers could see and manipulate. Instead, it was driven by a hedge fund or other institution using automated trading. It had a requirement in its system to liquidate a ton of stocks once we got a 5% dip in the Dow, likely to get some cash and then look elsewhere to reinvest it. Those sell orders helped wash out the market and fuel the sell-off. Take a look at how steep the sell-off got once we hit the 5% correction level. And this is a 5% pullback from the all-time high set a few weeks ago — so it was a broad level that all investors were eying that day. Sure, the initial sell-off on Friday and most of Monday was fueled by inflation and interest rate worries, combined with profit-taking. But that wouldn’t have sent the markets down that far, that fast. It was the surge in sell orders, likely automated, that hit the market at that 5% level and caused the sharp plunge. Nonetheless, this is still just a pullback in the general bull market that we will continue to experience. As I noted at the beginning of the year, market panics are likely this year, but we still have a couple of years left in the bull market.